Wearing a black chef’s jacket, Leo Ramirez, 58, instructs seven people during a morning cooking class. He covers everything from knife safety to ingredients to today’s menu: California club chicken wraps, sweet pie and strawberry ice cream. There is a babble of different accents. 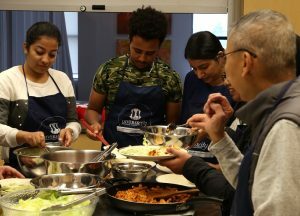 This is DIVERSEcity, a non-profit organization that has been running community kitchen programs in Surrey for over a decade. Ramirez, a volunteer co-ordinator and kitchen instructor, helps immigrants settle in to their new country through cooking. The class is meant to teach healthy cooking skills. But it has a side benefit. It provides an invaluable point of contact for newcomers, says the manager of volunteer and community programs at DIVERSEcity. “It can be a really good way for people to meet,” said Fiona Stevenson. Today, the students and two senior volunteers represented India, Pakistan, Iraq, the Philippines and Eritrea. Even the instructor is an immigrant. Ramirez himself moved to Canada from El Salvador as a permanent resident 29 years ago. DIVERSEcity runs more than 100 sessions every year. Participants attend multiple workshops specifically designed for groups such as refugees, seniors, young adults and low-income mothers from across the municipality. Surrey has one of the most diverse populations in B.C., with the second largest number of immigrants, only behind Vancouver. According to the 2016 census, Surrey has 220,155 immigrants, which represents 43 per cent of its population. Most moved to the city before 2001, but there is a considerable number of newcomers who are dealing with the challenge of settling in a new country. Between 2011 and 2016, 36,355 immigrants arrived to Surrey. Many of them join in the community kitchen programs each year. Food prices are high in the Lower Mainland and immigrants face particular challenges when it comes to getting food. The community kitchen classes teach solutions to these challenges. Those challenges include “not being able to afford healthy food, living far away, knowing what to cook here because they can’t find ingredients that normally they would be able to find,” Stevenson said. Back in the kitchen, Ramirez’s class trains 15- to 30-year-old people in something called the Future Leaders Program. The project teaches work skills to immigrants and prepares them for the Canadian job market. Rafael Morales said he is learning a lot in the program. The 21-year-old from the Philippines moved to Canada two months ago. He said settling in a new country can be very challenging and intimidating in various aspects. “I think it’s pretty hard to get a job in Canada if you don’t have any experience here or any connections,” Morales said. In DIVERSEcity, Ramirez has had the chance to interact with various nationalities. Last year, each group was from a different ethnic community. “I had kitchens with the Arabic community, with francophone Africans, with Koreans and Chinese, with people from Burma, with Latins. For each group, we gave three community kitchens,” he said. The program depends on external funding. DIVERSEcity has an ongoing contract with the City of Surrey to provide sessions for immigrants and refugees across the city, in places like community centres. 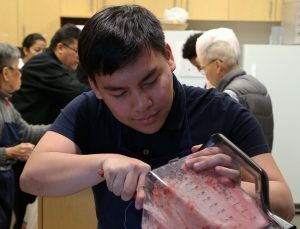 Other projects – such as multicultural workshops to train seniors to run their own community kitchens and also the Future Leaders – count on grants from the United Way, B.C. Gaming, New Horizons and other sources. For the next year, DIVERSEcity has already programed at least 50 sessions. A new project the organization plans to introduce is a community kitchen to bring refugees and Indigenous people together. That project’s go-ahead depends on getting more grant funding. While they have funding, they will continue doing more community kitchens, said Stevenson.